What are the social, political and economic attitudes of people in Armenia, Georgia and Azerbaijan? Do Georgians, Armenians and Azerbaijanis think employment or territorial integrity is the most important issue facing their respective countries? How do they judge the fairness of elections or media independence? How trusting or supportive are they of the European Union, NATO membership or local institutions? You can find the answer to these questions and many more in CRRC’s 2010 Caucasus Barometer survey dataset which is now available on the CRRC website. The Caucasus Barometer is CRRC’s annual and nationwide household survey conducted in Armenia, Azerbaijan and Georgia and is in its eight year. The survey covers a wide range of attitudes and opinions on economic, social and political issues. The 2010 survey also includes many new questions on gender issues, employment, internet and cell phone usage, as well as questions on Armenia-Turkey and Georgia-Abkhazia relations. 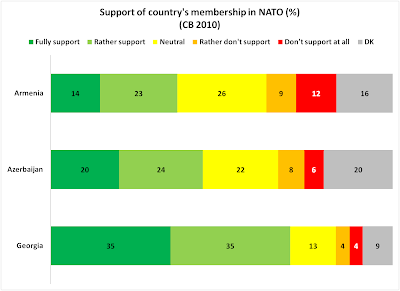 For example, here is a slide from the CB 2010 survey which shows that 70% of the Georgian population supports Georgia’s membership in NATO, while 44% of Azerbaijanis and 37% of Armenians support their respective countries' membership in the organization. 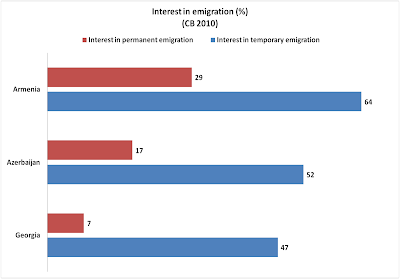 The next slide on emigration shows that Armenians are more inclined to emigrate from Armenia (both permanently and temporarily) than Georgians and Azerbaijanis are from Georgia and Azerbaijan, respectively. These are two examples of the fascinating kinds of data available from the survey. The questionnaire and dataset in SPSS or STATA are available on CRRC’s website. We welcome your visit!